Satellite communication is revolutionizing the delivery of content worldwide — new satellites are continuously being designed to meet this growing need for fast, cost-effective and global content delivery. Now, high throughput satellites (HTS) provide greater capacity than their counterparts by using multiple spot beams and competing with fiber in bandwidth, speed, efficiency and coverage. The satellite communication industry is constantly developing and improving the mobility, speed and ease-of-use of satellite terminals. The first two scenarios are similar in that they both require a communication system that is mobile, able to handle high data rates and quick to assemble and point. The requirements of an NGO or first responder team in an emergency environment, such as a man-made or natural disaster, are crucial to a mission's success. Their work could be in an area where existing communication networks are inoperable, or where the location is so remote or lacking in infra-structure that no communication network exists. Rapid, reliable and ultra portable communication systems are vital for aiding the survivors. These systems need to be simple enough to be setup quickly and then used by untrained operators who have other key tasks to focus on. Time taken to transport, assemble and point a system is critical and must be kept to a minimum. The sooner pictures and up-to-the-minute information on the situation can be transmitted from the disaster area, the sooner the rescue and aid organizations can respond properly. For survivors, the ability to access a WiFi network in order to locate missing family members and reassure relatives around the world cannot be underestimated. The second scenario focuses on the requirements of the broadcast sector in a similar environment. The world’s broadcast networks want to be on the scene as fast as possible to communicate live pictures and video to an awaiting world. While this is important for global awareness as well as for friends and families of those affected around the world, a rapid response is also a commercial necessity for broadcast companies. The first television or press organization to break the story gets the audience and the syndication opportunities. The correspondent who travels lightest, who is first off the plane and first on the scene, gets the jump on the rest of the press. If they are then able to assemble a SATCOM system in seconds and point it just as quickly, then their report is the one that hits the airwaves first. Additionally, both sectors often also need a satellite communication solution that is discreet. A large satellite antenna has no place in politically sensitive and volatile environments — such demands a SATCOM solution that is unobtrusive and quickly stowed. A terminal or antenna which is visible in this sort of unpredictable environment becomes a target. If the site is located in a busy city environment with large volumes of vehicular traffic and high-density, tall commercial buildings, then the satellite communication solution needs a small footprint and the ability to be located in an extremely protected area. In addition, the satellite terminal must provide high enough data rates to handle the transfer of large video and photographic files. Likewise, if an NGO is providing vital communications for survivors in a war-torn hostile environment, then a discreet, ultra-portable SATCOM solution is much less vulnerable and much quicker to stow and secure when necessary. Over time, these scenarios and many others like them, have presented themselves to Paradigm for a solution. The company’s many years of integration and development experience in satellite communications place the firm in an ideal position to respond. It was clear that the emergence of HTS would provide VSATs with the bandwidth and cost reduction to become an option for these kinds of situations. However, the VSAT pointing process was still too complicated for it to be an ideal solution. Paradigm’s design engineers studied the simplicity and portability of equipment already in use in these situations, such as BGAN (provided by Inmarsat, where a laptop-sized terminal can be used to connect via a low data rate link from remote locations) and compared it with VSAT setup and SWaP (Size, Weight and Power). Of particular interest was the set-up, point and re-deploy process. From this assessment, Paradigm has developed the Outdoor PIM (Paradigm Interface Module), a common terminal interface controller that operates many different types of VSATs. It minimizes the need for training by offering simple operation; using audio and visual cues to point a VSAT terminal and control transmission — all achieved with three buttons and a cross-hair target of LEDs. No screen to smash or freeze. No heavy, bulky motors or controllers to weigh it down and no additional engineering tools to carry around. The PIM is extremely rugged, weatherproof and very portable—all critical for global use in remote and demanding environments such as the ones outlined above. 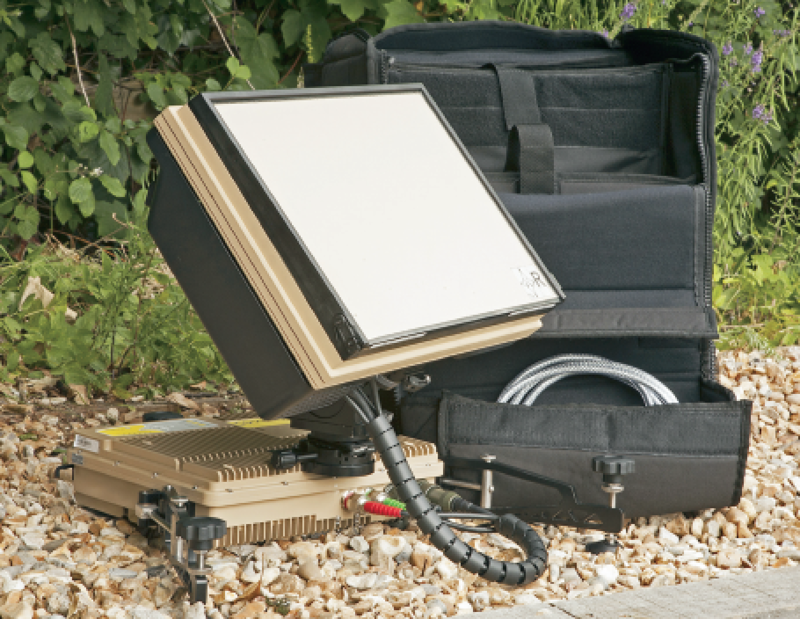 Next, Paradigm took on the challenge of designing a VSAT terminal around the PIM that was ultra-portable, highly discreet and quick to deploy and stow; factors demanded by the scenarios outlined earlier. The aim was to design a VSAT terminal that could be carried as airline hand luggage, be setup and operational by an unskilled user in less than five minutes and still deliver high data rates for video and image transmission. Better still, with Inmarsat’s Global Xpress, provide a terminal which can be re-deployed anywhere in the world without the requirement to contact the service provider. The ground-breaking Swarm45, released into the market in 2016, meets all of these requirements and more. The unit is a low-profile, 45cm flat panel VSAT with performance comparable to a 65cm parabolic antenna. Swarm45 is designed around the PIM for easy pointing and packs down into a lightweight backpack or hard case. 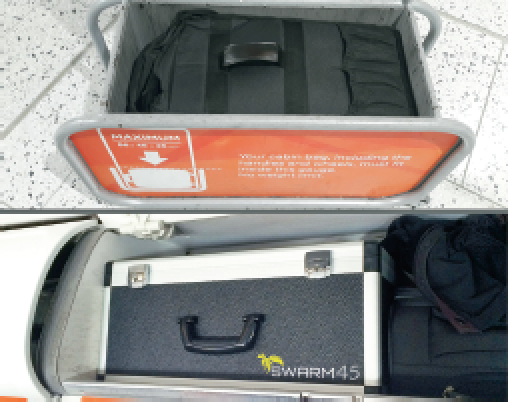 Crucially, both packaging options are compliant as airline carry-on baggage — a unique feature for the Swarm45. Setup is achieved in an astonishing 90 seconds and the user-friendly PIM allows even an unskilled operator to be on the air in 240 seconds. 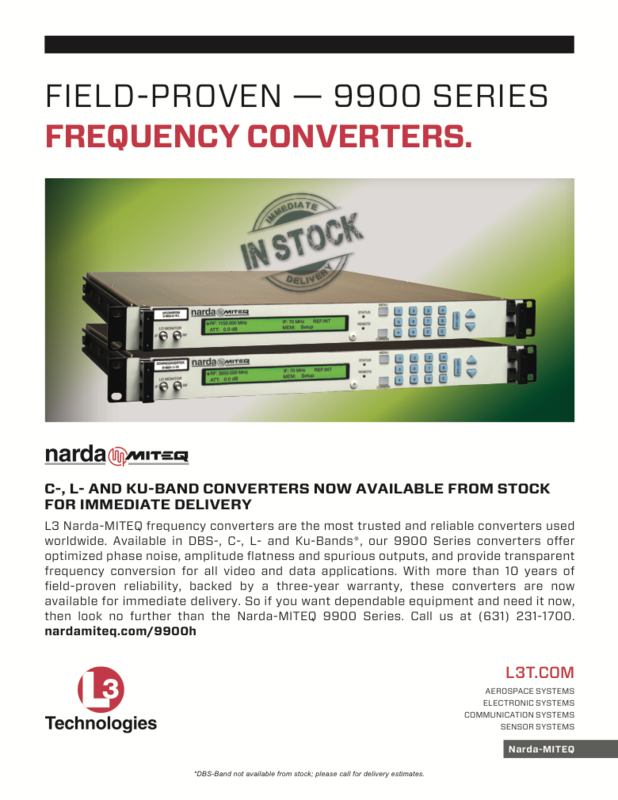 The flat panel design is reliable and greatly increases wet weather performance when compared to a unit with a parabolic design. Paired with an HD video send and receive comms system, the Swarm45 provides a complete portable media station. This combination creates the ideal solution for anyone working in remote areas who needs to rapidly and accurately communicate video and pictures to the world. The Swarm45 can operate in X-, Ku- or Ka-Band and is already compliant and used on many HTS networks, including Avanti, Inmarsat’s Global Xpress, Intelsat EPIC and Telenor’s Thor 7. 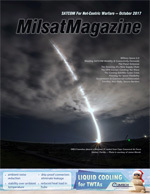 This level of global coverage and band flexibility, coupled with the considerable reduction in the average cost per Mbps of HTS bandwidth over FSS (Fixed Satellite Services) means that a SATCOM terminal — such as the Swarm45 — is a straightforward, cost-effective and innovative solution for the NGO, First Responder and broadcast markets. For more information on Paradigm and the Swarm45 please contact sales@40paracomm.co.uk. 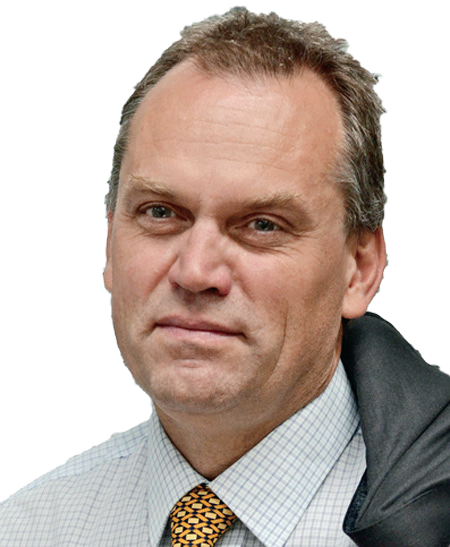 After a period in the Swedish Government sector based in the USA, he worked for Swedish Telecom International and then Unisource, where he became the satellite business Managing Director based in the Netherlands. Following time in Europe, San Diego and Russia, holding senior positions in a number of companies that included Versatel, ComStream and ACT Networks, Sandberg started Paradigm in 1996.